Back to it. After a blip in the music universe where I wasn't really feeling anything and was revisiting old Outkast (always pleasantly surprised to hear Dre on each song) and A Tribe Called Quest albums, it's back to some new stuff. And this one is brand new, as in leaked to the blogosphere yesterday new. 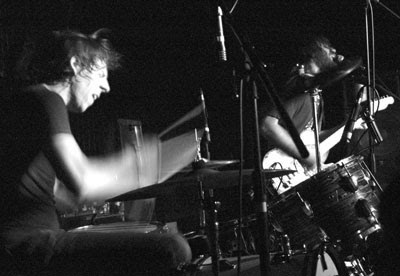 The Black Keys set an extremely high water mark for themselves with 2010's Brothers, which found itself near the top of almost every end of the year Best Albums list. El Camino, to be released in a week, might just sneak on a list too if it has its way. Though a shake less blues and a smidgen more soul than Brothers, El Camino still had my ears beaming this morning on my ever threateningly cold commute to work. Two standouts are "Run Right Back" and "Little Black Submarine." The former tells the tried and true story of running back to an old flame on top of fiery guitar licks and an edge missing from some of the other songs on the album. The latter starts off like a mellow campside jam session (including a tambourine from that buddy who always brings it, just in case) and wraps up with some White Stripes-esque guitar licks sure to fill up the bigger arenas that duo are packing these days. Check out these two choice cuts, buy the album here, and enjoy. Click here to download "Run Right Back"
Click here to download "Little Black Submarine"